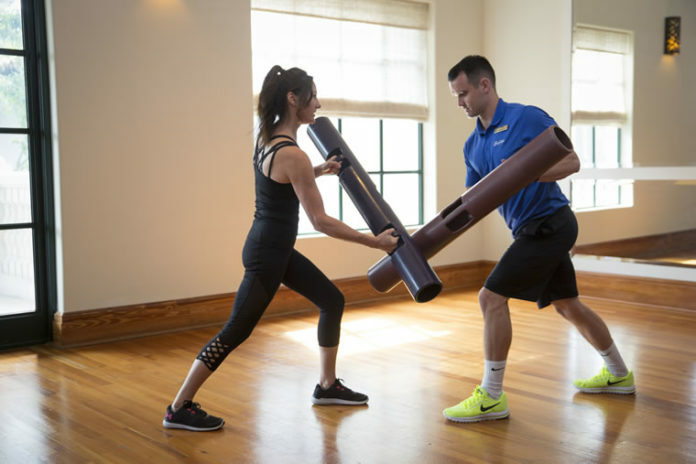 Classes at Sea Island are utilizing ViPR, an innovative piece of workout equipment. Sea Island’s exercise classes utilize the latest fitness craze for both strength training and mobility. The variety of fitness classes offered at Sea Island ensures that there’s an activity for everybody, whether it’s a slower-paced, shallow pool aerobics workout or a high-impact fitness experience. Now guests and members can take their exercise efforts to the next level with the help of ViPR, a weighted, cylindrical piece of fitness equipment that bridges the gap between strength training and more movement for a total body workout. ViPR can also be incorporated into beach workouts for groups and individuals, Hemmings adds, as well as into Sea Island’s high-intensity interval class called Wake Up Call. “This has been getting a good following, with a consistent number of guests and members between 12 and 20—and it’s at 6 a.m.,” he says. As for what his clients tell him when they use this new equipment for the first time: They love it, some because it is so unique. “They say it’s challenging, a great push and offers a variety of exercises,” Hemmings says.